Fishing Cataraft Wave Destroyer 12. Free shipping to any lower-48 address. Wave Destroyers are for both high flows and those who run steep, technical rivers, though in the case of this twelve footer, more of the latter. Think of it as the ultimate steep creek cat. Both this and the 13' Wave Destroyer offer a great option for solo class IV and V rowers. All four sizes of Wave Destroyers are somewhat slower in the flat sections and are not as much a "general purpose" cataraft like other AIRE cats. The type of boating you do will determine your choice, but for hair rivers these smaller sizes of Wave Destroyers are often as safe or safer than their big brothers. Back flips are extremely rare with the high stern kick, since big hydraulics you've just passed through cannot exert much downward force on the small pointy surface area of the W.D. tube tips. 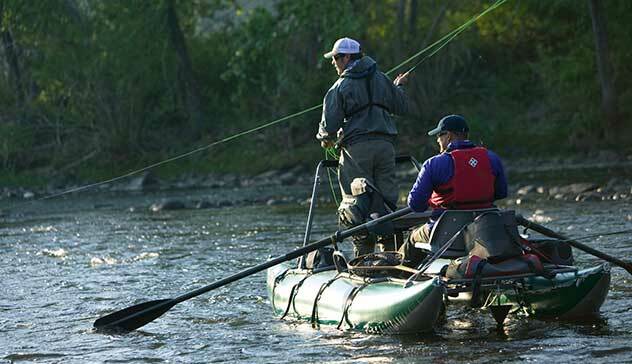 Please note that the pricing of all Fishing Cataraft shown on our site, and on all other competitor's websites, are for the pair of tubes only - not the oars, frame, or other accessories. All sizes of Fishing Cataraft Wave Destroyers are now theoretically available in the standard color selection of blue, red, yellow, dark orange, and dark green. Lime, two-tone gray, and the dark purple are by special order only. Best to have a second color choice with Wave Destroyers though, as these are only built in small quantities. Being more specialized, Wave Destroyers don't sail off the shelves in the same numbers as most of AIRE's other cats. So we generally do not keep these in stock, therefore please allow three business days on top of the normal delivery time from the west coast. The 12' Wave Destroyer, Fishing Cataraft, tubes weigh 52 pounds per pair and have sixteen D-rings and four lift handles total for a set. Frame chafers are standard, and the bow & stern rise is 33". Give us a call at 925-820-BOAT if you have questions. Frame NOT included. Fishing Pole NOT included!